1. Click on the Copy button as seen earlier in this section. 3. In addition to completing the Type field, you will now have the option in the Auto Fill menu to select the information that you want copied. You can specify which comp information will be copied by selecting the desired options below the Auto Fill menu. Click on ADD. 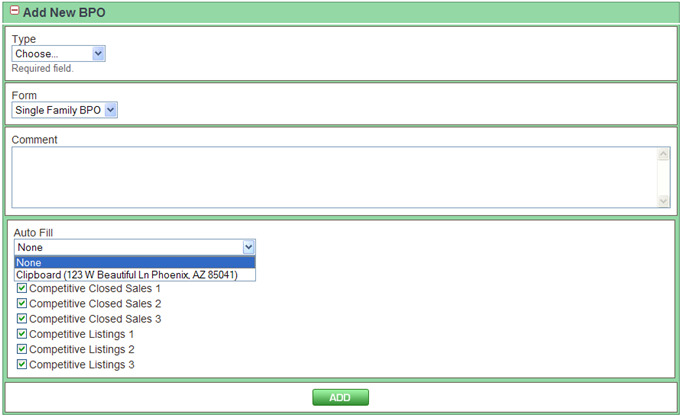 The Sub Form option will be grayed out because it will use the same Sub Form as the BPO selected in the Auto Fill menu. Not only is the comp info from the form copied into the new BPO form, but any comp photos from that property will also be added to the property for which the new BPO is being created. If the current property already has comp photos in the system, those will be replaced with the ones coming from the auto fill comps. You can also auto fill and copy comp information from the BPO form from the BPO that was most recently submitted for this property.